Northern Virginia East has a few counties and cities to represent it. Just like the rest of the state, the eastern part of Northern Virginia (NoVA) also lies next to Washington DC. Its location allows the residents to commute easily and quickly to the nation’s capital for employment opportunities in the federal government. The region has the highest income in the whole Virginia state and among the contributors are its transportation infrastructure, which includes the major airports of Washington Dulles International and Ronald Reagan Washington National. In Arlington County, the Pentagon resides, along with the Central Intelligence Agency in Langley, Fairfax County. With the affluence of Northern Virginia, residents and businesspeople need to be consistent with their surroundings. It is imperative that their homes and offices are clean. Tile and grout are installed on many floors, kitchens, and bathrooms and these things require maintenance, which The Grout Medic can easily handle. Northern Virginia East has a wealth of job openings with many companies moving to the region. Aside from government agencies, there are also other choices such as office work, particularly in the technology sector. The state has the second highest concentration of workers in the technology industry all over the country. When it comes to schools, Virginia has consistently ranked among the top 10 in the US. The state is the sixth in the nation with adults that have at least a bachelor’s degree. The local cuisine, on the other hand, is also exciting as it contributes to almost $10 billion yearly to the economy of Virginia. It now has more than 200 licensed breweries, and Northern Virginia East is where many chefs and restaurants with national awards are discovered. Homes vary from quaint to mansions, but the important thing is that they are all sparkling clean. To make sure your floors look good as new, The Grout Medic is here to help. If you cannot seem to clean your tile and grout in your kitchen, shower, or bathroom, it is time to call the experts who know how to manage the situation. The Grout Medic can transform your dull floor with grout that has become dirty over time. Do not wait for the tiles to crack before you do something. Call our professional team today so we can clean and protect your tile and grout from further damage. Many homeowners in Northern Virginia East think the problem is just the surface grime that they believe they can remove quickly. However, after mopping and scrubbing several times, the dirt and discoloration remain. It is frustrating, but The Grout Medic can solve these issues in no time. We will turn your porous grout into something that will not absorb dirt, bacteria, and even liquid. The Grout Medic will make maintenance easy for you. Grout is a porous substance, filled with microscopic holes that trap dirt particles as well as moisture and lime scale. Without proper grout cleaning, this dirt builds up over time can cause grout discoloration and creates an unsanitary environment in your bathroom or kitchen. Mold and mildew can also develop within the grout’s pores, causing it to stain the grout and affects appearance of the grout. The Grout Medic of Northern Virginia is proud of offer grout cleaning services, using proprietary products and environmentally friendly vapor technology. The Grout Medic deep-cleans grout with high heat, low pressure to remove dirt and grime, leaving it disinfected, fresh and renewed. The Grout Medic’s grout cleaning services are done with green steam grout cleaning technology to provide a chemical-free process. Our grout cleaning services provide a safe alternative to chemical cleaners most homeowners use daily. Hard scrubbing with the wrong tools and harsh chemicals can cause damage to your grout, but unaddressed maintenance can create long term issues. Both overworking and ignoring your grout can lead to costly repairs and grout replacement. The Grout Medic’s top-of-the-line vapor technology offers thorough grout cleaning with no damage. Rid your grout of the dirt and grime that’s been embedded for years! Don’t let the look of your tile surface be ruined by discolored and dirty grout. By scheduling a grout cleaning appointment with The Grout Medic of Northern Virginia, you can make sure your grout stays clean and in great shape for years to come! Call the The Grout Medic of Northern Virginia today at 703-530-9060 or fill out our quick Customer Info Form to get started right away! The best way to preserve the quality and appearance of your grout is through grout sealing services from The Grout Medic of Northern Virginia. We will apply our proprietary clear grout sealing material carefully to each line of grout. This sealant is designed to protect the porous grout from absorbing any dirt, preventing discoloration. The Grout Medic of Northern Virginia recommends grout sealing after every grout cleaning to ensure a long-lasting solution to grout discoloration every 2 years. Without grout sealing, you open the door for dirt, dust, and grime to enter back into the pores of the grout. Get grout sealing services from The Grout Medic of Northern Virginia. Call us at 703-530-9060 or fill out our quick Customer Info Form today! Color Sealing your grout helps to protect it and keep it looking great. 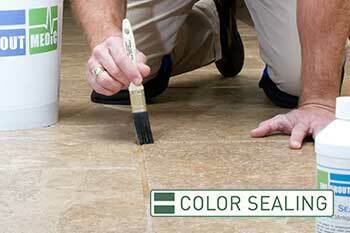 The Grout Medic of Northern Virginia is proud to offer color sealing services for homeowners and business owners who want to improve the look of their home while also maintaining the integrity of their grout. By applying a color sealant or grout stain to the grout lines, The Grout Medic of Northern Virginia prevents the contamination of your grout from all the things that come in contact with it. Grout color sealing provides a watertight barrier for your grout, so you can worry less and have beautiful grout lines. The Grout Medic of Northern Virginia would love to help advise you on the right tone choices for your grout color sealing job. The Grout Medic of Northern Virginia can clean and seal your grout right away, if you call us at 703-530-9060 or fill out our quick Customer Info Form! Discoloration also happens over time. When grout is left unsealed, it collects dirt, dust, grime, mold, and more materials in its microscopic pores. Even a simple spill on the floor can stain the grout for the long-term. The Grout Medic of Northern Virginia can clean most grout to like-new condition using our vapor technology, sometimes grout is stained so badly that there’s just no saving it and requires it to be regrouted. If your grout has become missing, discolored, or damaged, it’s time to have it removed and replaced by the experts at The Grout Medic of Northern Virginia. With regrouting services, or grout repair your tiled surface can look brand new again, without the hassle and expense of retiling. Regrouting services also provide health benefits, by getting rid of mold, dirt and mildew that’s built up over time. Instead of wasting time and money trying to re-tile the entire surface, regrouting services dramatically improve the appearance, almost as if you had replaced the tile altogether. Let the specialists at The Grout Medic of Northern Virginia remove and replace your grout. Call The Grout Medic of Northern Virginia today at 703-530-9060 or fill out our quick Customer Info Form to get help right away! When old or poorly installed caulk begins to crack and peel, the result is an unsightly area that quickly begins to collect mold, mildew, and mineral deposits. With tub recaulking and shower recaulking services from The Grout Medic of Northern Virginia, you can get a fresh, clean look and the assurance that caulk has been expertly installed. This service protects your tub, sink, tile and countertops from grime buildup and damage. Recaulking is one of the simplest things you can do to update the look of your home while keeping your caulked surfaces in great shape. But, like most sealants, caulk deteriorates over time due to extreme hot or cold temperatures, moisture, damage, and normal wear-and-tear and should be considered normal maintenance. This deterioration leads the caulk to crack and peel away, causing loose debris around your countertops and in your tub or shower. Likewise, poorly installed caulk can pull away from the seam and allow water to enter. With recaulking services from The Grout Medic of Northern Virginia, you get a clean, fresh seal and protection from future damage, mold, and fungus growth. Mold can be dangerous to your health, so it is important to protect all areas of your home against this dangerous substance that collects around old caulk. If see black spots or cracks along the caulk in your kitchen, bathroom or anywhere in your home, call The Grout Medic of Northern Virginia. Recaulking not only protects your tile and fixtures, it will improve the dirty look of your home. Recaulking is simple and quick with The Grout Medic of Northern Virginia. Call us today at 703-530-9060 or fill out our quick Customer Info Form. There’s a good chance you don’t need to completely retile to fix the problem of damage, loose or missing tiles if you have tiles or can find replacement tiles. 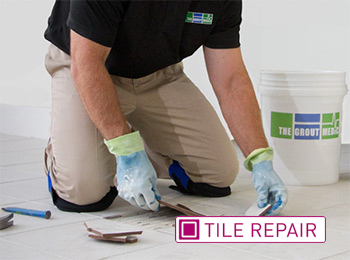 The Grout Medic of Northern Virginia performs tile repair services. Our technicians can visit your home to recommend whether you’re a candidate for a simple tile repair or tile replacement. It’s smart to have the tiles replaced or reset. even the smallest cracks or chips in your tile could lead to a more severe problem in the future. The talented technicians at The Grout Medic of Northern Virginia will visit your home to evaluate your tile damage and recommend repairs. Whether you need tile repair or replacement, or grout repair or replacement due to tile damage, The Grout Medic of Northern Virginia can ensure a nearly flawless, attractive result. You deserve to have beautiful tile within your home, and there’s no reason to wait! The Grout Medic of Northern Virginia can repair your tiles quickly and affordably. Call us at 703-530-9060 or fill out our quick Customer Info Form today! If you’re worried that loose, hollow, or missing tiles mean you must completely re-tile your floor or backsplash, take a step back and call The Grout Medic of Northern Virginia. Our skilled technicians can replace individual tiles or entire sections, saving you the time and expense associated with a complete tile remodeling job. To ensure high quality results, tile removal and replacement should be performed by a professional. Our technicians will visit your home to assess the damaged surface and determine the best course of action. We will replace cracked or chipped tiles, and place new tiles in bare spots, leaving you with a clean, elegant-looking surface. We will also make any necessary grout repairs to be sure that your tile surfaces are secure and stable for years to come. Tile replacement services also extend the lifespan of your floor and can serve to reduce future repairs. The Grout Medic of Northern Virginia can make your tiled surfaces look like new again at a fraction of the cost. Don’t put off tile replacement services so long that you’re forced to completely re-tile an area of your home. Call The Grout Medic of Northern Virginia for a free estimate. Get a free quote on tile replacement services from The Grout Medic of Northern Virginia by calling us at 703-530-9060 or filling out our quick Customer Info Form! Tiled surfaces on tub and shower walls that have missing grout, cracked grout, or simple things like caulking along corner seams cracked or missing lead to water penetration behind the tile surfaces causing the wallboard behind the tile to get wet and damaged. The Grout Medic of Northern Virginia, our technicians can provide water damage repair for your shower or tub walls in your bathroom. When water damage repairs are not addressed, the unattended areas may develop mold and mildew, causing a health risk for you and your family. Also, water damage causes other issues in the home like water spots on ceilings below and can most likely cause mold. Most people shouldn’t wait to have these areas fixed. The caring technicians at The Grout Medic of Northern Virginia will schedule a visit to your home as quickly as possible to assess the damage and begin work right away. • The Grout Medic of Northern Virginia removes water-damaged areas in showers of the home. • The Grout Medic of Northern Virginia can refinish the area to your specifications. Water damage in showers cannot wait! For the protection of your family and your home, have water damaged repaired immediately by The Grout Medic of Northern Virginia. Call us at 703-530-9060 or fill out our quick Customer Info Form! The Grout Medic is the premier tile and grout cleaning service provider in the Northern Virginia East region, including the areas of Alexandria, Arlington, Vienna, Fairfax, Burke, and Great Falls. Call us today and schedule your free estimate from our professionals. There are many benefits of contracting The Grout Medic for all your tile and grout cleaning needs in Northern Virginia East. Whether you’re looking into buying, selling, or just trying spruce up your property, we can help you to make your tile and grout shine as it did the day it was first put in. Thank you for such a wonderful job. Dante was extremely professional and efficient. I wish I had done this years ago. My shower looks brand new. Kathy, MacGibbon Fairfax Station, Va. I am extremely satisfied with the caulking job Dante did. He was here on time, work quickly and efficiently, made almost no mess and cleaned up perfectly. The shower looks new again. I will definitely call you with any future needs. Thanks for your professionalism and expertise. Just wanted to provide feedback after Jason’s completion of my shower grout project. He did an excellent job and I completed the follow up surveys with all 5s. Thanks for providing a great service. Just wanted to tell you we are pleased with the work Jason and James did in our Master Bath shower, everything looks wonderful. Jason and James are both very nice and professional people, they were a pleasure to work with. We would like both of them back when we do our other bathroom. Mr. & Mrs. Varner Dumfries, Va.
Just wanted to let you know that Dante did a great job. My shower floor now looks like I expected it to look after the job was done. Just wanted you to know what a nice person Jason was and what a great job Jason did todayon our master bath shower regrouting project. I will definitely refer The Grout Medic to my friends. I just want everyone know at you office to know how gracious Dante was. He did a great job on the Master Bath shower regrout and caulking, everything looks wonderful. Thank you. Mary Jo Ervin Chantilly, Va. I had such a wonderful experience working with The Grout Medic, you will defiantly be hearing from me when I move into my new house, and need more tiles worked on. Thank you. WOW! I am thrilled with the work performed by the GroutMedic team. I had a leak in my master shower and had tried plumbers and handymen. When Dave came to give me an estimate, it was extremely clear that he knew what to look for — he located the issues and gave me a variety of options and costs from the minimum needed to stop the leak to making the bathroom look like new. I chose to make the bathroom look like new. The team arrived on time and were extremely professional and polite. They took the time to carefully listen to the problems and then specifically made sure that all the issues were addressed as they completed their work. They did not cut any corners, but rather went above and beyond to make sure that the finished product was perfect. They were so neat and careful. My bathroom looks brand new, and it cost about 1/4 of what a remodel would have. I plan to have them back to regrout 2 additional bathrooms. They were excellent. The gentleman who came out first to investigate everything, he gave a proposal. He provided a discount because I was an Angie’s List member. The gentleman was clearly knowledgeable. He carefully examined everything. He shared with me the pros and cons of everything we were dealing with. The grout in the entry way was cracking so he figured the tiles straddling a beam were the ones cracking and causing the problem. The subfloor he figured should be thicker and made me aware that the grout could crack again. In my master bath shower they used epoxy in the grout and assured me that should never crack or come out again. When they began to work on the shower, the gentleman realized halfway through that between the shower and the wall was quite damp. They did not finish the work because they wanted the wooden panel to dry out before they completed the work. I very much appreciate their professionalism and their work. I would highly recommend them. Their honesty was very much appreciated. David quickly responded to my email requesting a free estimate of the work that was needed. The appointment was scheduled on September 29th, and David arrived promptly. He was professional, knowledgeable, and courteous, and I trusted his opinions on the work that needed to be done. Wanda scheduled the work to be done, and because two bathrooms were involved, she scheduled two separate appointments, a week apart, on October 7th and October 14th, so that we could use one shower while the other was worked on and allowed to set. She was very patient as I tried to figure out the best timetable for my family, and even called the day before each appointment to remind me of the scheduled work. Dante, who performed the work, was punctual, professional, and very friendly. In my childrens’ bathroom, he willingly caulked around the bathtub ceiling light, as well as replaced the caulk around two tub guards, caulking I hadn’t realized needed to be redone when I talked to David. Dante also left the areas where he worked spotless. All in all, I’m very pleased with the work done by the Grout Medic team. I can now take showers without cringing at the mildewed caulk or worrying about water seeping into cracks in the grout and damaging the walls. I definitely recommend their services, and will be using them again should the need arise. Thanks to all! The service provider was very friendly and helpful. As he was removing tiles, I realized he might be able to replace the bathtub faucet which would leak water when someone showered. He agreed to do so, and explained exactly what type of faucet to look for. While he worked, I rushed to the nearby Home Depot and purchased the faucet, and he replaced it without charging extra. I really appreciate such excellent service.